In our 700th post (700!) 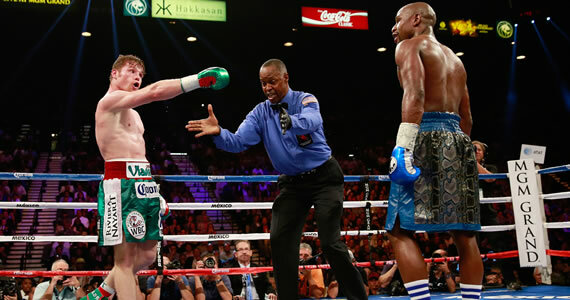 Jobu reviews “The One,” the fight between Floyd Mayweather, Jr. and Saúl “Canelo” Álvarez. I first wrote about this fight back when they announced it in June. In that post, i posed the question “Can Mayweather survive Álvarez?” Boy was I wrong. Not only did he survive, Mayweather pretty much picked the younger, stronger champion apart. Now, don’t get me wrong, it wasn’t a “wood shed” situation. Alvarez said it best himself. He was prepared, he felt strong and good, but he simply could not catch the 36-year old Mayweather. It was a big lesson for Álvarez, as well as every Floyd Mayweather doubter on the planet. This fight was billed as “The One” for many reasons. Would Mayweather continue to prove he was “The One,” aka the best pound-for-pound boxer in the world? Could Álvarez be “The One” to finally knock Mayweather off his pedestal? Would this fight be “The One” we’d all remember forever? At the end of the day, the monicker of “The One” remained steadfastly in the corner of Floyd “Money” Mayweather, Jr. The champ proved, once again, that he is seemingly unbeatable. First of all, let’s get some cool statistical stuff about this fight out of the way. The PPV numbers aren’t out yet, but it’s believed that this would be the highest grossing PPV draw of all time, and there’s really no reason not to believe that will be the case when the figures drop. Mayweather is the most must-see boxer in the world today, and Álvarez has been touted as the future of professional boxing and the most popular Méxican boxer in the world today (he famously packed nearly 40,000 people into the Alamo Dome for his last fight), so none of those numbers should come as a surprise to anyone who follows the sport. Short of the proposed Mayweather vs Pacquiao fight from a few years ago, I’m not sure I can think of any other spectacle that would have drawn better in today’s boxing world (maybe some of those Ali vs Frasier fights would have challenged the PPV buys for “The One”). This fight also broke the record for biggest purse, with Mayweather taking home the new high of $41.5 MM for roughly 36 minutes of work. When you take into account whatever deals “Money” has as related to PPV buys, ticket sales and concessions (I am sure he’s got his fingers in everything), there’s speculation that Floyd could end up pocketing $100MM from the fight. Canelo’s purse doesn’t even come close to that, but $12MM is certainly nothing to shake a stick at. There was also a minor controversy about the catch weight of 152 lbs. Mayweather’s camp maintained that Álvarez’s trainers were the ones to say they were willing to fight at the lower weight (Álvarez normally fights at around 170 lbs), while the Álvarez camp insists that it was the Money Team that wanted the weight. We probably will never know the truth, but I don’t think it mattered in the end. The weight loss didn’t seem to sap Álvarez of any of his trademark power or stamina. The fight itself had just about everything a prize fight should have. Mayweather showed why he’s by far the best in the world. Álvarez showed exactly the talents that he was advertised to bring to the table. The star-studded, celebrity-filled crowd was hyped throughout, and the refereeing from Kenny Bayless was even spot on. 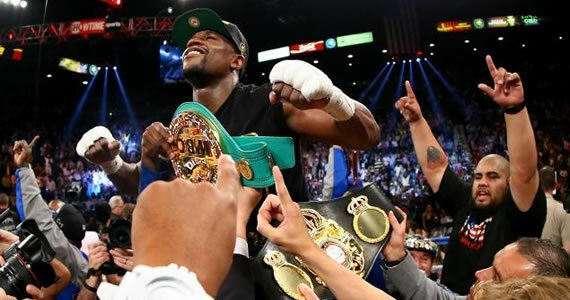 Mayweather and Álvarez did their best to give the fans a great show, and they did just that. You could tell what the game plan was for each man as soon as the fight started. Mayweather’s plan was to basically not get hit, which he managed to execute while still standing toe to toe with his bigger opponent. Floyd has really impressed me of late with his fight choices, especially this one. Not only did he choose the best available opponent, but he mostly stood toe to toe with the youngster and still won. Álvarez, meanwhile, was out to show that he could not be intimidated by his older, wiser opponent. There were times where Floyd attempted some gamesmanship (a glove tap here, a kidney punch there and even a shove or two), only to be met with a low blow or shoulder shove for his troubles. Álvarez definitely was not intimidated by either his opponent, or the biggest stage. Towards the end of the fight, you could see that “Canelo” was growing more and more frustrated with his inability to catch Mayweather, but I wouldn’t say he lost his composure. While Floyd didn’t do much damage to Álvarez, and won most of the rounds, I wouldn’t call this a beat down. It was simply a lesson from the best in the world to a guy that I think could still very well be the future of boxing. His day will come, it just wasn’t September 14th. I think the future of boxing will be decided whenever Mayweather decides to walk away, and not a minute before that. I don’t think Álvarez has anything to be ashamed of. He fought his fight. He fought a good fight. 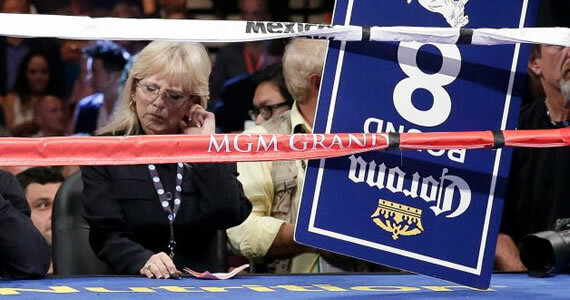 It was just a matter of not being able to catch Floyd, which the young Mexican admitted in the post-fight interviews. One thing I will say about Floyd Mayweather. He may be cocky, flashy and brash, but he was very gracious after the fight. He praised Álvarez’s abilities and corrected professional idiot Jim Gray when he referred to Álvarez’s status as the future of boxing in the past tense. Floyd said “Canelo” is still the future of boxing, but the future will simply have to wait to begin. Álvarez was also very gracious in defeat, praising Mayweather and calling the fight a major lesson learned. One thing to note was the fact that, as Paulie Malignaggi said on the broadcast, one of the judges must have gone to the bathroom during the fight. The Showtime guys scored the fight heavily for Mayweather, as did the other two judges (and my buddies and I scoring at home). The only person who saw this differently was judge C.J. Ross (pictured), who somehow thought the fight was a draw. The 114-114 scorecard prompted a priceless reaction from Mayweather, and scoffs and guffaws from pretty much anyone on the planet with two good eyes who happened to see the fight. Keep in mind that this is also the same judge who had the extremely controversial score that caused Manny Pacquiao to lose his title to Timothy Bradley… Maybe some discipline, or a change of profession is in order for Ross. Clean that up, lady. Finally, I think I feel the worst for Oscar De La Hoya. Mayweather won and made more money than I will ever even see in other people’s wallets, so he’s great. Álvarez really comes away from this fight looking like the same exact prospect he looked like beforehand. There’s no shame in losing a decision to the best fighter in the world. For De La Hoya, his quest to see Mayweather beaten continues, seemingly without any hope for success. I imagine he had to be watched pretty closely after this one. Just give it up, Oscar… It’s not worth the anguish.